← I Want a Silverback Father! Freedom is Creating a Fabulous Elephant! 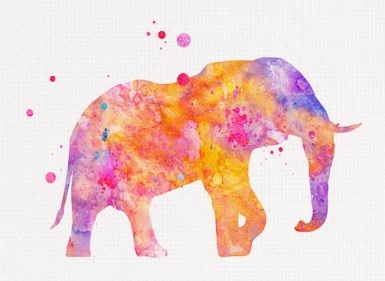 I remember hearing about an 8-year-old girl who painted a picture of a fabulous elephant. What made her elephant earn the distinction of being fabulous? She used a wide array of colors. Unfortunately, her teacher was stricken with an adult brain and was therefore incapable of seeing the fabulousness of that elephant. So instead of enjoying the unique creation, she felt it her duty to inform the little girl that elephants are not multi-colored. No, we adults don’t know elephants very well—we don’t know a lot of things very well because our perceptual filter is so narrow. Children, on the other hand, are not confined to a rigid idea about reality. They don’t deliberately think outside the box . . . they just don’t see the box. The box doesn’t exist. I like that. How unfortunate that so many of us mistakenly carry around the notion that we’re supposed to outgrow such traits. Doing so is something I call self-abandonment and a recipe for either a boring existence or depression. No wonder we grownups are inclined to turn to the bottle, the pill, wild parties and so forth to remedy this sorry condition. But, as we all know, those things are merely band-aids. They’re no substitute for reclaiming our lost self. Think about it, do children seek out the substitutes? No. They don’t have to. They’re neither enslaved by convention or weighed down by adultishness. The child within each of us contains the seeds for authentic happiness. The path to reclaiming that inner child looks different for each of us. I had conversations with Drake, Bud, Jane, and Garth about walking that path. There can be no change, no opening to a new way of seeing and being as long as we continue to tightly grip that which is no longer working. We have to be willing and ready to let go. And we attain the know-how for doing that by becoming young again—young enough to be able to paint a fabulous, multi-colored elephant! We live our life the way we’re “supposed” to and wonder why we’re so miserable. The message we keep hearing is clear: Leave the box. The arts take us back to our inner child. The practice of art allows one to break all the established rules and invites us to step out of the box. I love that the child didn’t give in to the teacher’s concept of elephants. That’s true. She didn’t abandon herself . . . how inspiring!